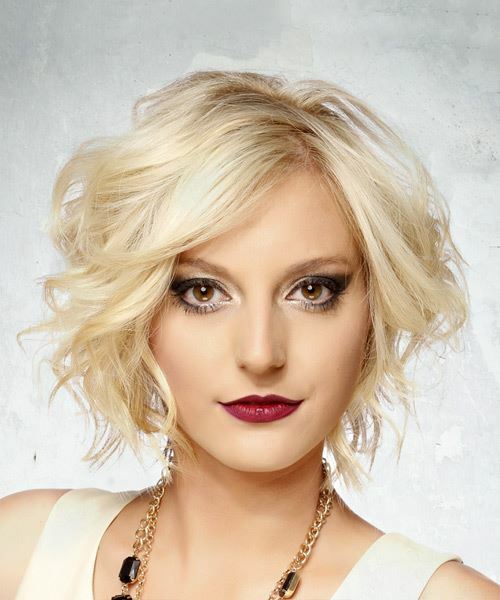 Our model's short light blonde bob is enhanced with layered ends and corkscrew curls to encourage movement and body. This chic graduated bob is ideal for fine to medium hair types. This fashionable 'do is perfect to compliment an oval or oblong face and needs product throughout- especially at the sides- to create and hold this voluminous look and feel. Teasing the curls slightly will add even more texture. To keep the color looking fresh, root touch ups and silver or ash toning treatments will maintain an icy cool light blonde tone. Apply mousse to towel dried hair to help form and hold these adorable curls. Apply a small amount of gel to your fingertips and then lightly piece and pinch the ends of your hair.